I’m now a cyclist. The Wandsworth one-way my time trial. Lavender Hill my mountain stage. What surprised me was the transition and how easy it was. I have referred to why I have found myself making it before. 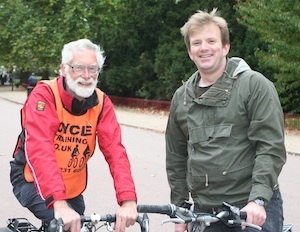 I spent a couple of hours last Saturday being trained by Cycle Training UK courtesy of the Wandsworth Cycling Campaign (WCC). It was certainly an eye-opener. Having avoided cycling for the best part of 20 years I had no real confidence on a bike (especially in London traffic) and little understanding of the needs of cycling. But, of course, part of the point of WCC’s ‘Movers and Shakers’ (opens a PDF) campaign is to increase awareness of cycling issues. So while before I thought it was all about cycle lanes I would personally say that facilities (like places to secure a bike) at destinations are far more important in encouraging people to cycle. It’s obviously early days: since my training session I’ve only managed one cycling commute (to and from the Town Hall for last night’s Local Strategic Partnership meeting) but I’m intending to keep it up – at least until my savings in bus fares cover the cost of lights and helmet for my borrowed bike! I will post on my experiences from time to time, but it seems to me that the hardest bit is over, and was remarkably easy. What should the next challenge be, the London Marathon? I’m from CTUK and I just want to say well done for getting on your bike and congratulations on your first commute. Do keep it up – you will cover the cost of helmet, bus fare and light and a whole lot more in a very short time (and get fit)! Rob James is a great instructor – would you mind if we put this link on the news section of our web site? Again, I have to thank CTUK and WCC for this opportunity – without it I may never have given cycling another go – I will be posting on progress and (theoretically) you should be able to find it by looking for the ‘cycling’ tag on posts. Well done, James! Good for you – the more people cycle, the safer it becomes for all of us. Totally agree with Jean’s comments, and if there’s anything WCC can do to support you in your cycling, don’t hesitate to get in touch.